We're sorry, mom and dad. Your son is no longer your son. He has fulfilled his destiny and followed the path of the burning dragon. Now he is reborn as the Golden Dragon Warrior Ninja Death Master Warrior Dragon (We're still trying to lock the name down. Too long? It's too long, isn't it?). Yes! And now his skills will give him the power to defeat the great evil order secretly planning to take over the world. Only one boy can stop them. Only one Golden Dragon Warrior Ninja- Okay, you get it. Yes! With his martial arts skills and ninja training, there is no match for his power. Of course, his power isn't nearly as effective without his special Golden Dragon Ninja Warrior suit. How else will people recognize him as the great master he is? And how else can he keep his identity secret? After all, he doesn't want that evil order looking up his address and coming to attack his family, right? He's got to take precautions, hence the mask. No one can know who this great warrior is. Only the people who do his laundry. So you must allow him to unleash his inner warrior, to fight for justice from the shadows, and to eat as many chicken nuggets as he wants (Don't look at us, that's all him). No evil is safe! 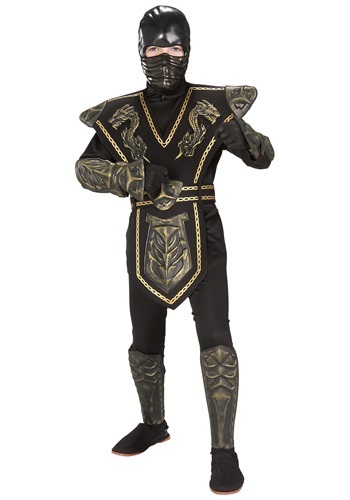 So help your son become the chosen one with this warrior uniform. He may have to go into the mountains for training, but when he returns, he will be wiser, stronger, and cooler than before he left. That is the Ninja Golden Dragon Warrior Ninja Dragon way.